Lady of Guadalupe is one of the most beloved images in Hispanic culture and is very well-known within the Catholic faith as well. In the Catholic faith, the feast day for Our Lady of Guadalupe was yesterday Dec 12th. "Our Lady of Guadalupe , also known as the Virgin of Guadalupe, ( is a title of the Virgin Mary associated with a celebrated pictorial image housed in the Basilica of Our Lady of Guadalupe in México City. The basilica of Our Lady of Guadalupe is the most visited Catholic site in the world, and the third-most visited sacred site in the world." Just a little history I found on the Internet! 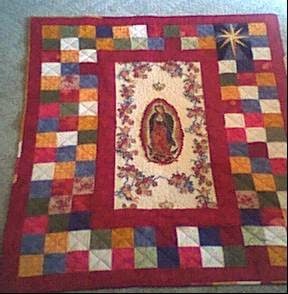 I thought I would share The three quilts I have made with Our lady of Guadalupe on them. I made these for my friend Nancy's grand kids. This one I made up as I went, kind of a crazy patchwork with scraps. You found some very unique and beautiful ways to showcase the panel sections. These will be loved. Nice job!! Your first one is my favorite, too! You've just given me an idea for how to use my panels. Thanks for sharing.